The TT (Total Totals) is an index used to assess storm strength. 2. How is TT determined? The TT is a combination of the Vertical Totals (VT) and Cross Totals (CT). The VT is the temperature difference between 850 and 500 mb while the CT is 850 mb dewpoint minus the 500 mb temperature. 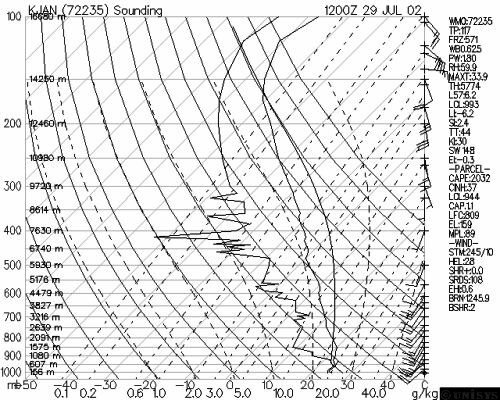 a. TT does not assess wind shear and CAPE directly. See CAPE and shear environment to see how relevant index is for severe storms. b. May not pick up a capping inversion that prevents storms from developing. c. Index will be too stable if a layer of moisture is just under the 850 mb level. d. VT may be very high and contributes to causing a high TT even when moisture is lacking. Index will be too unstable in these situations. e. Works best for flat areas in low to moderate elevations. Does not work for high elevations. f. Index value interpretation varies with season and location.